Discussion in 'iPhone and iPad Games' started by WaveLightGames, Aug 20, 2015. *** Touch Arcade's RPG Reload Golden Poncho Winner 2015 (Top 5 Best Original RPG's of 2015) *** Rated 4 out of 5 Stars - "The sheer variety and amount of things to do and play around with outclass most of the game's peers in this genre." ~ Touch Arcade *** Top 10 Best New Games List on MacLife.com Requires an iPhone 5, iPad Mini 3, or iPad 3 or later - will not run on earlier devices. Enter the depths of the ancient city of Angor and prepare for battle. Form a mercenary party of adventurers, sell swords, rogue sorcerers and assassins and enlist with an army of Dwarves trying to retake their ancient homeland. Fight in a brutal campaign against goblins, undead, ratmen and the demon lords they worship. 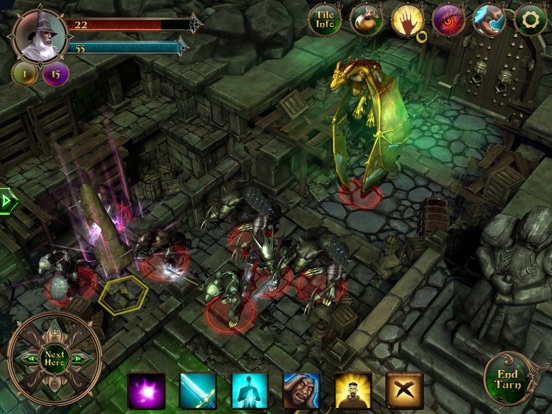 Demon's Rise is a turn-based tactical game where players must lead a party of six heroes through the bowels of an underground city. 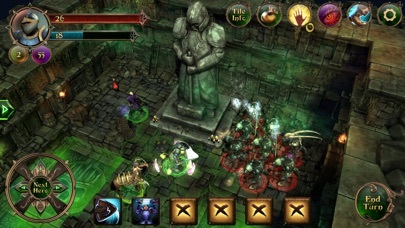 Battles are intense affairs where the proper use of terrain and cover is as important as the choice of spell or attack. BATTLES: Fight through 35 grueling campaign levels and another 51 patrol missions. 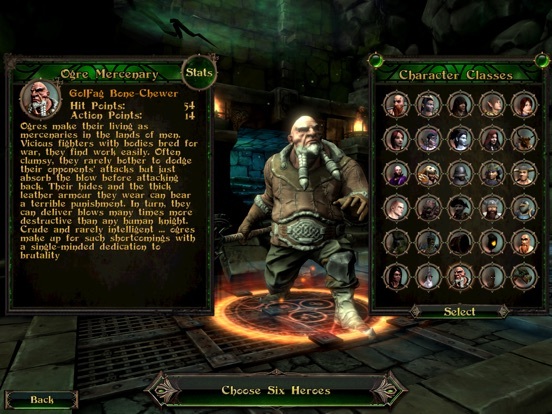 CHARACTERS: Choose a band of six heroes from 30 playable character classes. Each class has unique strengths, weaknesses and special abilities. REWARDS: Uncover the treasures of the old kingdom ... find gold or thousands of possible weapons, pieces of armour and artifacts. Equip them to make your heroes stronger or sell them off and buy something more fitting. 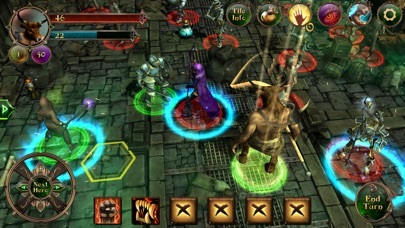 EXPERIENCE: As your heroes fight, they gain experience, level up and unlock powerful new spells and abilities. COVER / TERRAIN: Position is key to victory. Place your heroes behind cover for protection or next to a magical shrine for extra power. MORALE: Your heroes and their enemies may panic when they see the battle go badly or enter a berserker fury if they see an ally cut down. Form a tight battle line where your stronger heroes can lend courage to the weaker ones and use intimidation as a weapon against your foes. ABILITIES: Wizards can launch fireballs, cast protective wards or summon powerful monsters to their aid. Illusionists can trick their enemies into switching sides or make them panic without reason. Mighty warriors can make powerful weapon strikes, become berserk or heal themselves during battle. All 30 player classes and many of the enemies you will encounter can perform such abilities and can use them to turn defeat into victory. 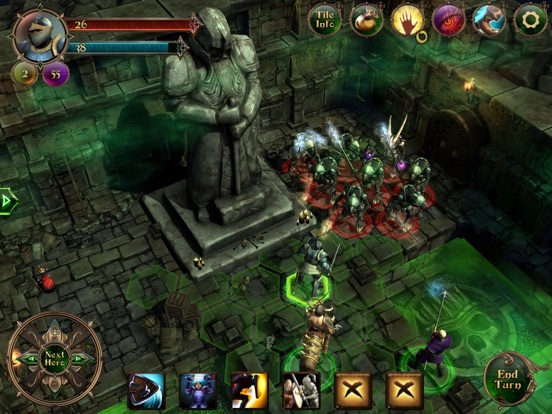 Demon's Rise is a traditional game with NO IN-APP PURCHASES or unfair "pay to win" mechanics. Victory is earned through courage, strength and tactics and not additional spending. * Requires an iPad 3, iPhone 5, iPad Mini 2 or higher. 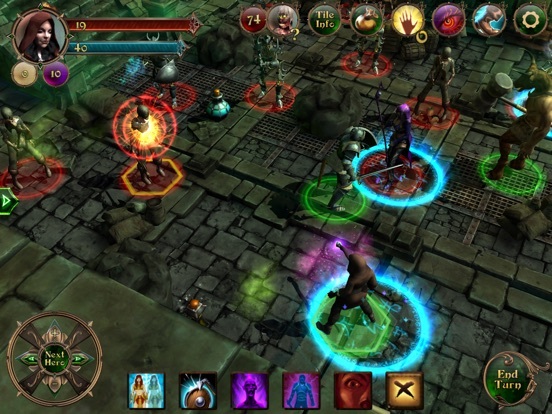 Demon's Rise is a tactical, turn-based RPG that places an emphasis on both traditional RPG mechanics such as character levelling and equipment / loot and tactical considerations such as the use of cover, line of sight, area of effect of attacks and morale of combatants. Set in a dark fantasy setting, players are tasked with forming a mercenary party and fighting as scouts on the side of a Dwarf army trying to retake an ancient, underground city. 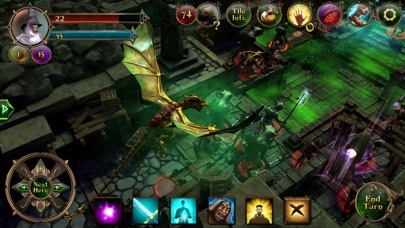 An RPG designed from the ground up for quick mobile play, gameplay is divided into battle levels / encounters that are meant to be played within 10 to 20 minute sessions. 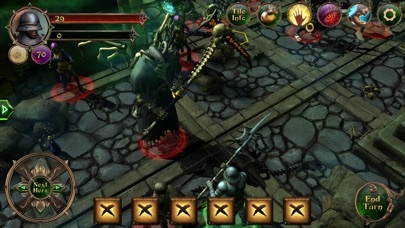 Tactics and strategy are in no way watered down, however, as the underlying turn-based combat and morale system is highly developed and rewards intelligent, tactical play. This will be the official support thread as well for the game. We're hard at work on the first content update for the game and will be regularly posting previews of that update here as well. Thanks everyone ... we're so glad we made it over the finish line. We could not have done it without the tremendous support of the Touch Arcade community! I know the dev isn't exactly a major gaming powerhouse, but damn this is good value at $2.99. Thanks guys ... appreciate the support. If you do pick up the game, please do take the time to leave a review. It really does help us out tremendously. Here's the first of many previews for the upcoming free content update ... called "The Dead March". It'll feature 5 quest levels, 8 patrol levels, a new playable character class (Dwarf Dragon Hunter) and lots of new undead enemies. Here is a picture of the Grand Necromancer ... basically a corrupted, human death mage. She won't be physically too tough but will have insanely powerful spells. She'll likely be the most powerful caster in the game so watch out. Alpha/beta was all kinds of fun. Congrats on the launch! TBS fans, you probably can't go wrong with these combat mechanics. 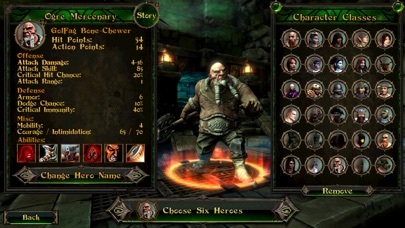 With 24 heroes to choose between (each with five quite unique active abilities, and large differences in base stats and equipment), there is an absurd amount of combo and synergy depth and variety (especially since you choose five heroes per playthrough, and thus have ample and possibly obsessive reason to replay again and again), and the above-mentioned cover and morale mechanics only add to the delightful confusion. I might be back with something more akin to a real review (and more balanced impressions. Being an indie title, not every aspect of the game is as polished as the tactical mechanics, and there isn't much of an attempt at a compelling narrative). 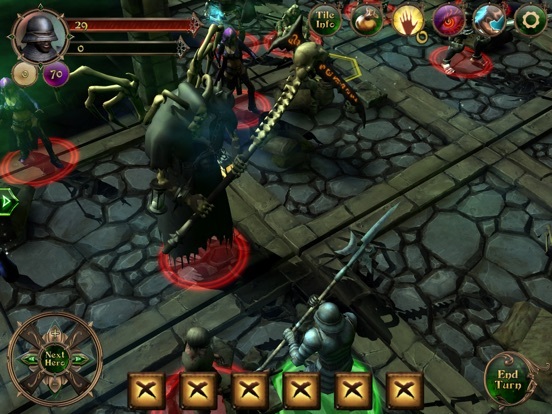 But fans of tactical turn-based games with RPG elements need not wait further. Hit the link to download even before reading the thread. Looking forward to this for a while. I might be back with something more akin to a real review (and more balanced impressions. Being an indie title, not every aspect of the game is as polished as the tactical mechanics). But fans of tactical turn-based games with RPG elements need not wait further. Thanks Ayjona ... really appreciate the kind words and in depth analysis. Please do let us know where you think we can polish things up when you have time. We plan to support this game for a long time and (hopefully) use the core game engine to make a few more titles so we are eager to improve it in every way possible. Great game! Congrats from Brazil! Now that I'm playing the finished product (and have more time than back in alpha, during which I was sadly a bit too occupied to fulfill my tester duties), I'd be happy to return with suggestions for improvements! I'd love to see the game grow and the delightfully tactical engine be used in further titles! Fantastic so far. Just started but loving it. Fantasy. RPG. Walking cannons. Turn based. $2.99. Just wanted to give you guys a massively big thumbs up! I have only just downloaded the game and played for about 30mins having finished the tutorial and first mission, but I wanted to give my first impressions. The amount of depth in this game is incredible. And the stats! oh those lovely juicey stats...instant plus. This feels like an old school pc tactical rpg, which I love. The graphics are very good on my iPad Air with all the graphic options ticked. The voice acting while limited is very good. The little extra touch of occasionally auto zooming in on a fight action is very cool, though it does zoom in a bit too much imo. A little suggestion...add footstep sound effects. Its not a dig deal but it is noticable. Question: How long is the campaign supposed to be? Final opinion so far on my short play through. Absolutly fantastic. Definately buy this if you in any way like tactical turnbased rpg's. It is a very small price for a very impressive game. bought, looks very nice, going to play it tonight. Comparing to XCOM how is it? Different, but overall better in my opinion. Demon's Rise doesn't have the base building, research and "miniquests" XCOM spouts. You have one team that you stick with through the whole campaign, not a whole roster you can/need cycle through like in XCOM. In terms of equipment, skills, team synergy, tactics DR offers a lot more. 24 chars to choose from (and at least one more in the works) make for a lot of possible combinations. I never finished XCOM, because I found the later stages way too long: One hour, and I'm maybe only halfway through that starship? No, thanks. DR is much more accessible in that regard, and plays much smoother and faster. A very long stage might take you half an hour, but that's about it. No tedious slogging for an eternity until you finally meet the next bunch of monsters; and then spent another half hour trying to figure out the best approach that doesn't get your team fried in turn 1. If you like tactics games, you'll do good with this one. No offence intended but I always find these sort of comparison questions very vague, but the poster is expecting long drawn out comparisons. What is it you like about XCOM exactly? What in particular do you want to compare? If you are not specific then the answers cannot be specific. I for one am not going to ramble off a whole lot of comparisons when really all you might be concerned about is, for example, the base building aspect (which btw this game has none). How about you tell us what you like, or dislike, about XCOM and then we can give our impressions about how this game compares. So with that all said and in answer your question:....in comparison to XCOM, this game also has turn based combat that takes into account your surrounds to give you extra defense. Is there any other comparison you would like to know about? Nullzone I see is far more forgiving and has given you a rather complete comparison already. Hopefully all your concerns have been answered. Looks very interesting. What kind of leveling system and character customization options does this game have? Can I develop my heroes in various ways as they progress through the quests?